“The Sri Lanka (SL) Netball team expects to go a long way at the 10th Asian Senior Netball Championship in Bangkok, Thailand, starting with the curtain-raiser against newcomers Afghanistan. 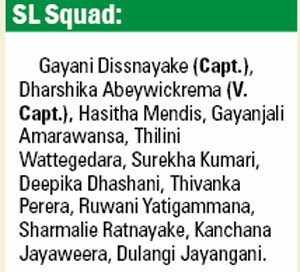 With an expected win against the Afghans tomorrow (August 1), the SL lasses are determined to finish the tournament as Asian winners,” captain Gayani Dissanayake told the Sunday Times. Ten teams are participating in the Championship which concludes on August 7. Defending champions Singapore are slotted with Hong Kong, Chinese Taipei, Thailand and Maldives in Group ‘A’, while in Group ‘B’ Runner-up SL are with Malaysia, Brunei, Japan and Afghanistan. SL will meet Japan in the second match on August 2, Malaysia on the following day, and their last Group match will be against Brunei on August 4. Asian Champs Singapore is 24th and SL is 27th according to the latest World Netball rankings. According to SL captain Dissanayake, except for Malaysia which is a fairly strong outfit, SL will not face strong challenges in the 1st Round. Dissanayake a former Visakhian with 7 years of National level experience, is employed at the HNB. She earlier represented the Navy Netball team . She was the deputy skipper of team that participated at the Netball World Cup held in Sydney last year, and Captained SL when it won the Asian Youth Netball Championship in Hong Kong in December last year. Dissnanayake’s main aim is to win the Asian Championship as SL ended Runners-up in 2012 (Colombo) and 2014 (Singapore) losing to Singapore in the finals. On the other hand, Singapore too will be aiming for a hat-trick of Asian Championships this year, with SL all out to stop them in this edition. SL were Champions on four occasions in 1989, 1997, 2001 and 2009. Singapore has won the Championship thrice in 2005, 2012 and 2014. Malaysia were the inaugural winners of the Asian Netball Championship in 1985. At the last World Cup where 16 teams qualified, SL and Singapore were placed 16 and 15 respectively. Deepthi Alwis a former SL Captain will be the coach, whose daughter Semini Alwis led the National side at the last World Cup in Sydney. Semini failed to find a place in this year’s team for the Asian Championship. A noteworthy feature is that, the team will leave without an Asst. Coach and a Trainer. Vajira Pushpakumari, a former National player is the Manager of the team. Who should run school’s rugby? What are the responsibilities of the Board of Control for Cricket in Sri Lanka?